Toraysee™ products are very versatile, great for wiping and polishing all kinds of items and surfaces. For wiping surfaces inside production and testing processes. For use in clean rooms.There are many ways you can use Toraysee™. For cleaning a variety of medical equipment and instruments and inside hospitals and clinics.Micro-fibers and micro-pockets wipe dirt clean away. 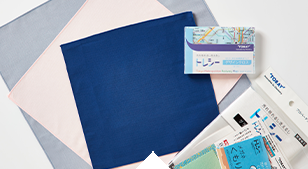 Toraysee™ is a cleaning cloth made using Toray's ultra-fine fibers, known as microfibers. The microfibers penetrate all types of dirt, including oil films, and cleanly wipe away dirt that ordinary fibers cannot. 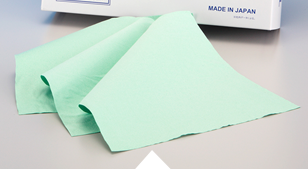 This cleaning power is provided by Toray's unique microfiber textile structure, and can even be restored by washing* if dirtied. This means the product can be used many times, making it environmentally friendly. What's more, the quality and performance have been highly praised within the high tech electronics industry, where microscopic dirt is a particular concern. As a result, the product has found use in a wide range of applications, such as wiping cloths for cleanrooms. It's been over 20 years since our establishment as a top manufacturer of glasses cleaning cloths. The Toraysee™ Skincare series, born from word of mouth regarding using glasses cleaning cloths for face cleansing, has now had a variety of products added to its lineup, and we hope to continue as a trusted brand in the beauty sector. *Toraysee™ Industrial Cleaning Cloth should be washed and reused based on the customer's judgement, and the customer should take responsibility for adequately checking any impact on quality as a result of reuse. 1. Exceptional cleaning ability, due to 2-micron diameter microfibers. 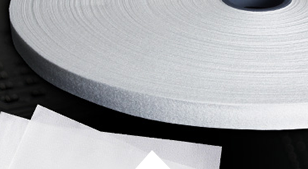 Ordinarily, standard fibers with a diameter of approximately 15 microns cannot completely wipe up oil film dirt with a thickness of 1 or 2 microns. Toraysee™ has fibers of approximately 2 microns, thanks to Toray's high polymer chemistry technology. The microfibers enter the oil film one after another, cleaning away the dirt. 2. Avoids wiping cleaned-off dirt back onto the lens. The unique fibers in Toraysee™ have many gaps within them, called micro pockets. Wiped-up dirt with oil or water constituents is carried to these micro pockets through the capillary action. As a result, dirt doesn't remain on the surface of the cloth and isn't reapplied to the lens. 3. Cleaning power is restored by washing. No lens damage is caused by the fibers. Toraysee™ isn't treated with chemicals, so even if it gets dirty, the cleaning power can be restored by washing. This makes it reusable time and again. The materials are also highly durable, and the fibers themselves don't damage lenses. 4. Also well suited to accessories, watches, phones, and more. As well as lenses, it has a variety of other everyday applications, from mirrors, glass, plastic and metal surfaces, to accessories, watches, phones, and LCD screens on portable devices.